You Are "Loved"! Give Away Time! Let me just start with Thank You! Thank you for supporting this little dream of mine! We recently did a little sprucing up on our shopping site and added some fun new products. It's now live and I want to celebrate with you! I would deeply appreciate you helping me spread the word about the launch of our newly remodeled MariRobeson.BigCartel.com! It is because of your support that I have been able to grow this dream. So for that reason I want you to know that..."You Are Loved!" So as part of this little party, I've decided to do a Give Away! What better way to celebrate?! 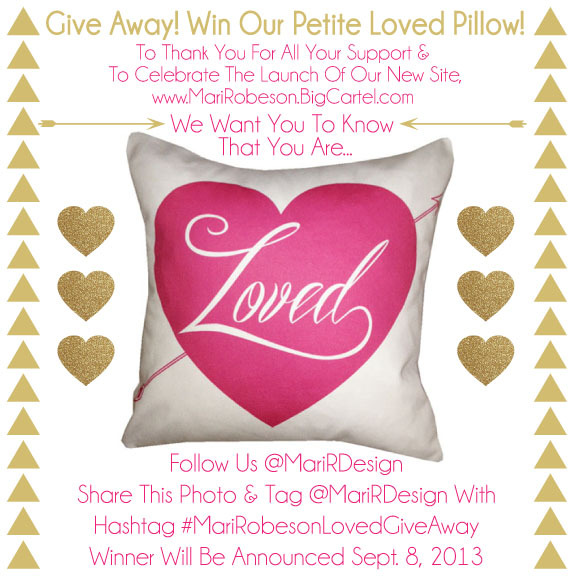 On September 8th I will be giving away one of our Petite Loved Pillows! Leaving a comment on this post telling me, who you Love the most! And/Or~ head over to MariRobeson.BigCartel.com and subscribe to our newsletter! Any one of these will do! Good Luck & Thank You So Much for your ongoing Love & Support!